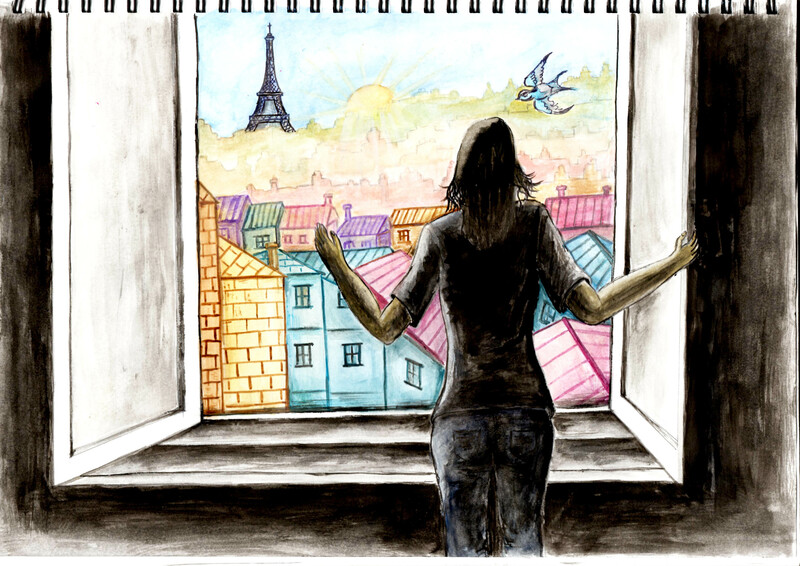 Make a list of words that describe the illustration you want to create. 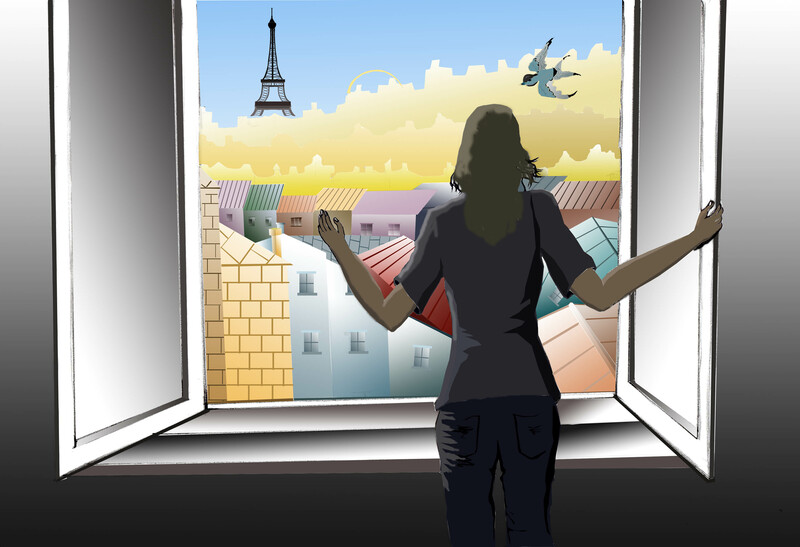 Window is the border between the different status of the disaster in the room but the bright lights of city to look at outside. Woman (narrative) The women has a pose shows that life is changing from the struggle over lost family to being able to face life anew. 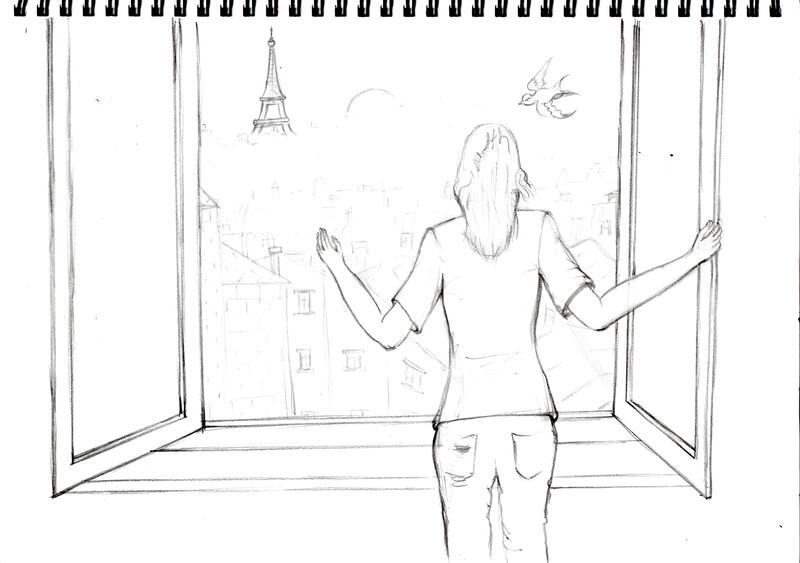 She maybe opens the window to get a breath of fresh air. Eiffel Tower shows this story happened in Paris. Daytime/night/Sunshine or lights which ever one is best for outside I haven’t decided yet. The scenery of city means a new situation to face. A dog (a companion) But not sure yet. A bird (swift bird)(Spring is coming) is singing to please the ears. Something I have found out which is inspired from the film Ghost. The women thinks her husband is still with her in heaven. I don’t know how can I convey this point in my image? This illustration I want to produce is offering an opinion. 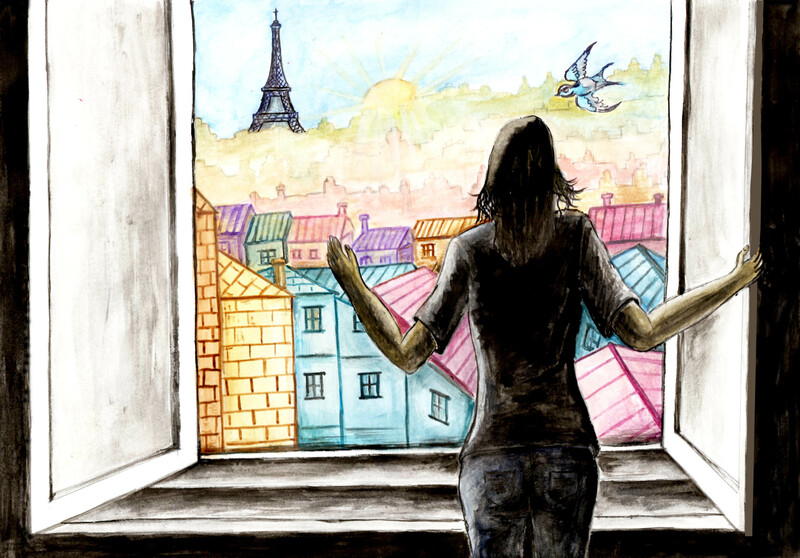 When the woman is opening the window there is fresh air, city signs, Eiffel Tower and sunlight outside. Christmas is coming and after that new year then Spring they are all on the way. 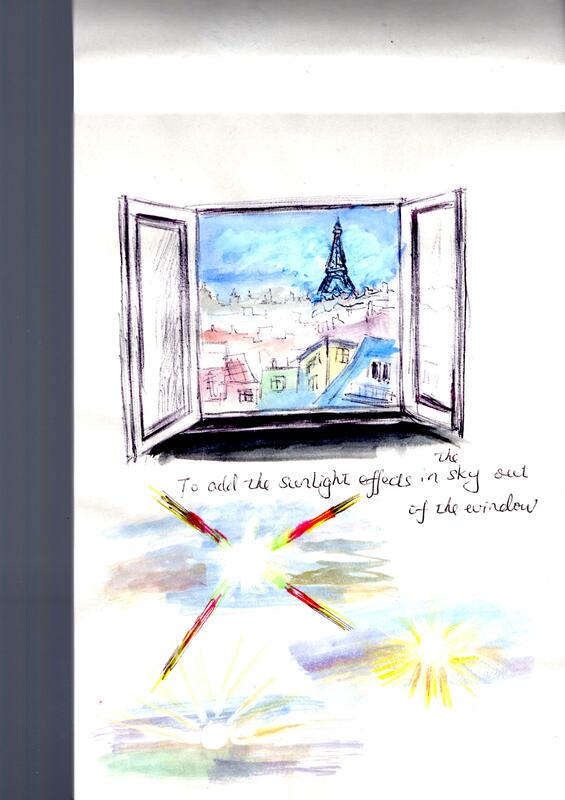 I also tried to practice sun light around the Eiffel Tower a couple of ways but it seems I have not found out the right one yet. Then I quickly enlarge my image to arrange every element on the paper. Also to think about landscape or portrait? After that I have created a line visual by pencil. I also created a palette for this image but do these colours match well? I am not sure what they will be they like when I colour them into the image. Next I am going to use photoshop to place the colours onto my image. I will separate the 2 parts of this room, that is the inside and outside. First I have used dark colours for inside which are black, various tones of grey and blue to convey the covered atmosphere. In my opinion these dark colours will convey the terrorist threat still covering Paris. 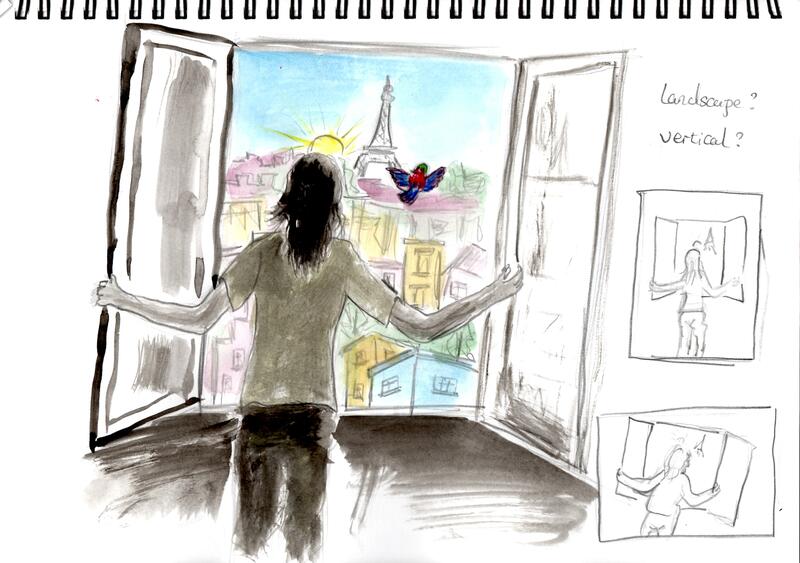 Then the outside is another world: beautiful city, colourful buildings, the Eiffel Tower, sunlight and the bird is singing. So the woman try to reach out for these to get a new life for herself. Then I was struggling with making the sunlight effect. I have tried Filter-Blur-Radial Blur and Filter-Render-Lens Flare by Photoshop. I have been just using trial and error and I don’t know which one is the best of these? Also I know there are many digital medium that can do this better but I can use photoshop better than the others. If I get the time to try I’d like to learn more ways either by drawing or digital media. 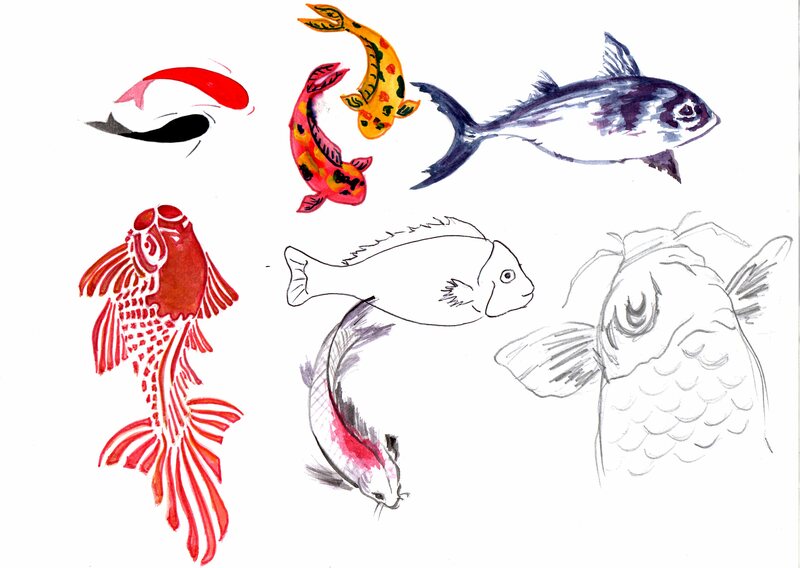 Now I am going to tint the line image freehand and using my digital visual as a guide. Before I tint it I just change a little bit of the women’s right forearm. I was keeping my method to be black in sharp contrast to the other colours. But I have to admit my brush is very rough and ready. So to have pure black colour in the drawing I really need to improve my skills and have more practice. I’d like to use one of the digital ones for my final image. Overall did I make the black area (the inside bit) too big? I tried to cut off some out of the last image. It does not feel better than it was before. 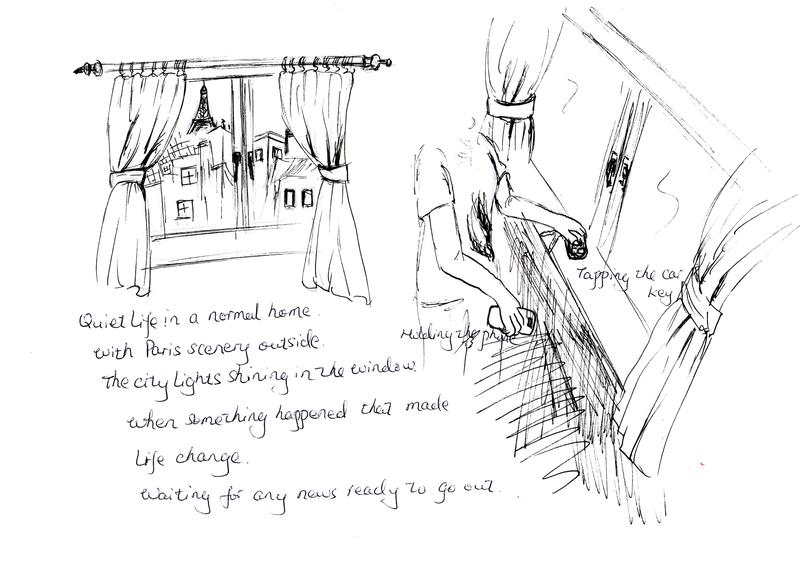 I was thinking about there must be some more ideas to convey the beauty of Paris but I am struggling here. I was thinking about her husband in heaven as the story like the film Ghost. Her husband aids her to find new life but I decided not to follow this idea. When I was considering the phrase Paris still the best place on earth I wanted to show the beauty of the city of Paris in the skyline. I wished to temper this with respect for the atrocities that have taken place in Paris recently and to have a balance to my image. Now I need to imagine that I have been commissioned by the paper to create an illustration. I decided to do the part “Paris, still the best place on earth” which is one of the 8 articles. I have chosen this one because after I read my feedback from my tutor from my last assignment i was interested that the tutor felt my work was a bit superficial. As she said, the ideas could be explored more further. 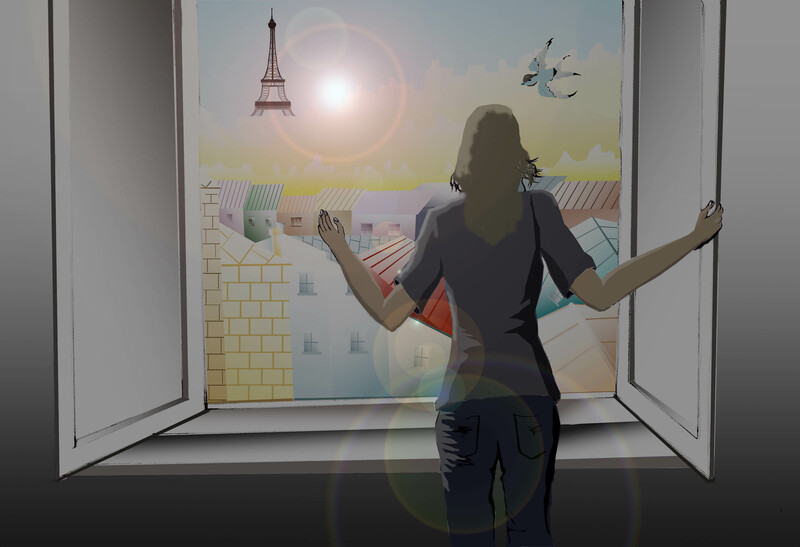 So with this task I am not doing how attractive the scenery of the city of Paris is but I am still working on the theme of continuing the work of the city after disaster (Cast Away) and that the Parisians are not afraid. 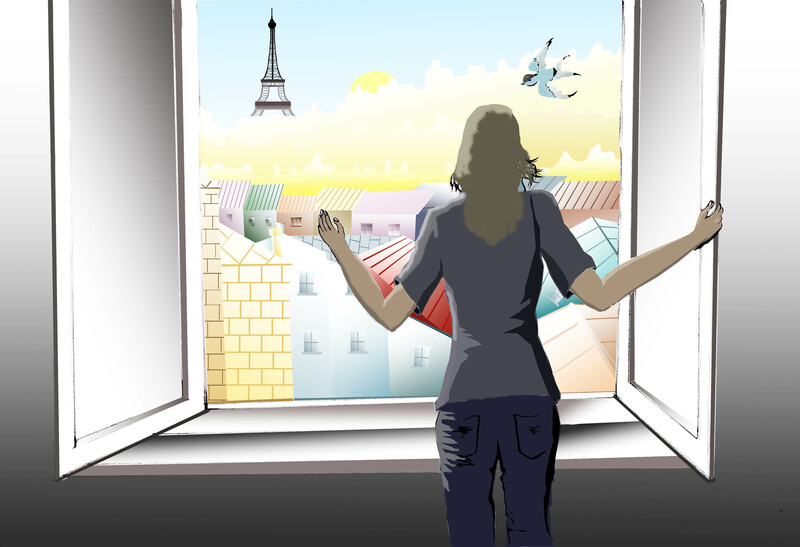 For this exercise, I am focusing on the point “the whole world is in Paris” and I am writing some sentences by myself. The city of Paris is one of the world’s leading business and cultural centers today. It is a center for entertainment, music, media, fashion, cuisine and the arts all of which contribute to its status as one of the world’s major global cities. However this beautiful city has this year suffered attacks which make Parisians struggle to process the horror of assaults. It’s a wounded city now. For the Parisians they have lost relatives and loved ones. How can they remember the people who are gone? How can they put the memories from their minds? How can they carry on their life without their loved ones? Do they still live in Paris? Where can they go? The main issue will be to get their lives back to normal? If I need to highlight a sentence or words in my article they should be “get their lives back to normal”. These words are in my mind after what has happened in Paris recently. I am going to hand draw and sketch down ideas from when I read through the article. I am thinking about the background of the wounded city now. I have used the lines to depict a normal home and after the woman is waiting for news. Then I am going to try black and white to evoke the atmosphere in which the woman is missing her lover. She is using a red lipstick to draw a heart. This lipstick maybe her favorite one, she always to wear and maybe before her husband left for work they had a last kiss. It is very difficult when you try to control the black colour in painting, first you need to know very clearly your high lights areas otherwise you will be fail to produce the image. 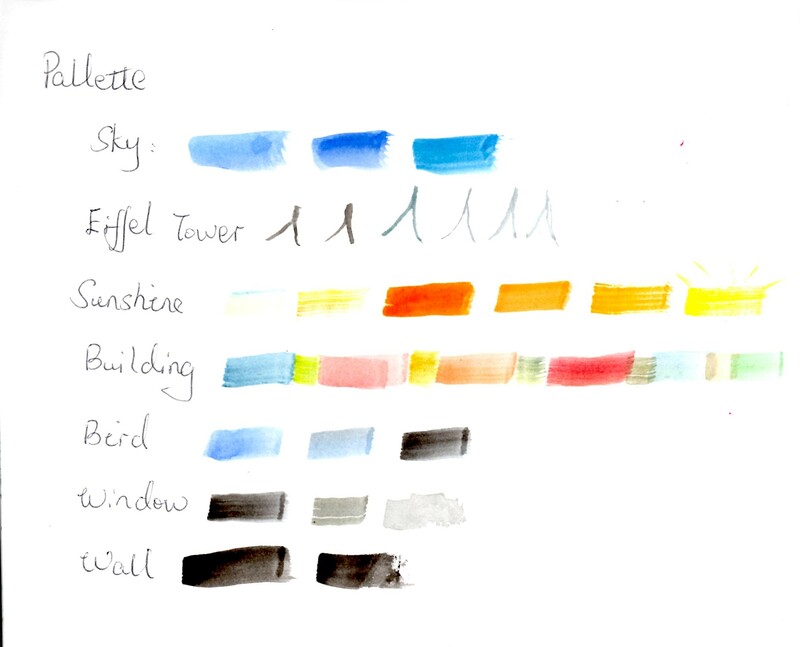 In the first one I have used white crayon before painting the black colour but in the second I only used some white colour pencil then I have washed in some dark areas, with some white colour as well. I did enjoy the process of visual brainstorming and what ever results from it but the rooms look very dark in the final images. So I need to find some better reference points from other artist to learn. For this exercise I collected some newspapers with some articles that contains an illustration. My first search was for illustrations of pictures about food which I found in a M&S leaflet. The headings for each article are Turkey, Cheese, Christmas Pudding and Chocolate. When I think about it in my head, they are all foods I like to eat. These pictures are not coloured but they are clear in their lines and tones. They are representational informational illustrations helping you to use up leftover food. 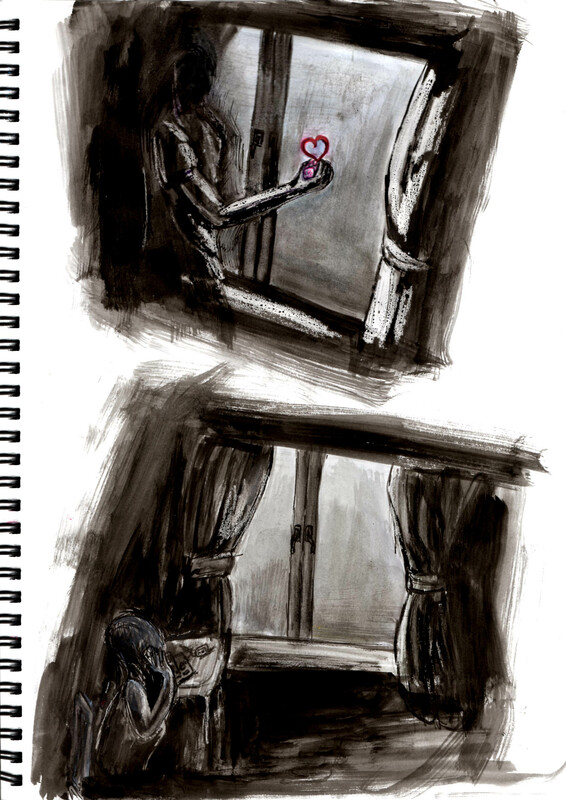 My second search was a mixed medium which has photos and illustrations together. They are recipes with text and diagrams showing information about the images. Again they are about food In this case a little more narrative about how the food is produced. 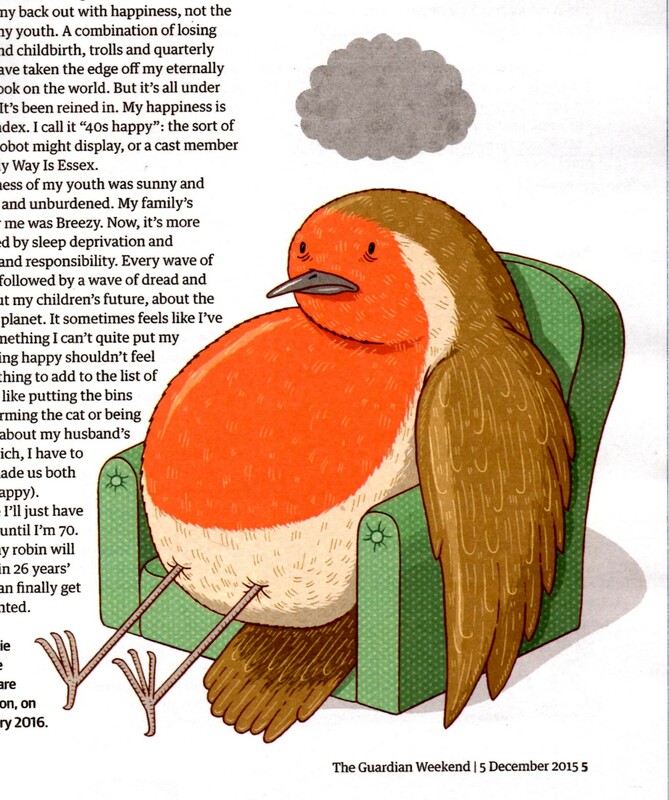 These two illustrations are a robin and a woman both from the both are in articles by Bridget Christie. The headings for these are Chirpy and Suffragettes. 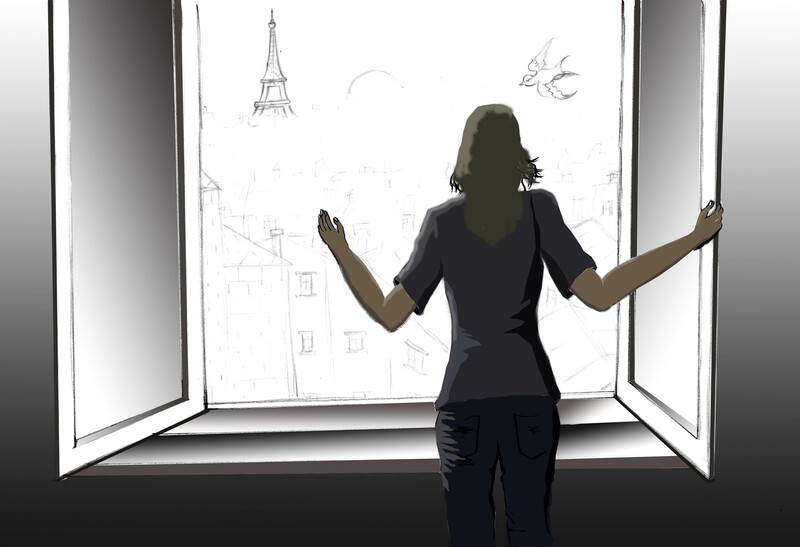 The image of the robin is usually seen as an happy image, in this case it is drawn in different way as a metaphor for the unhappiness and her struggles to change this. 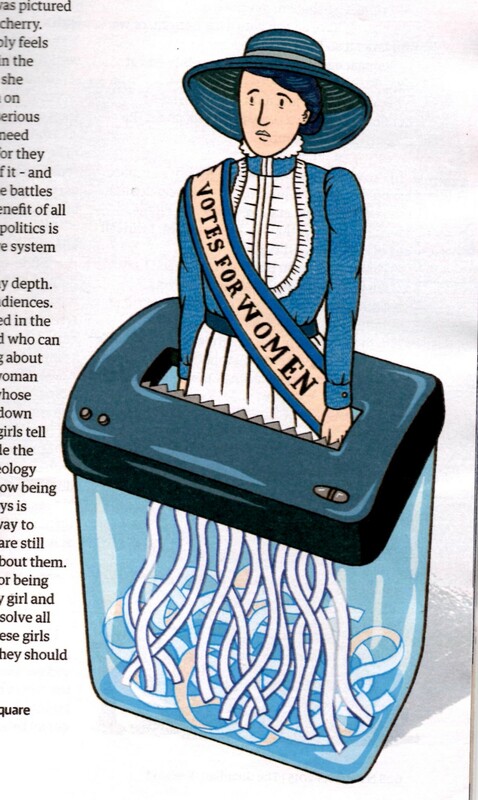 The article with the suffragette being shredded is asking if there is no need for this sort of struggle any more. These are both images that are linked to the narrative and represent an attempt to encapsulate the essence of the article. The brief for this exercise states that all my work exists as my property not only as work to satisfy an exercise or assignment. I need to look through my work to date and identify the elements and images I have enjoyed. I need to look at what I enjoyed most aesthetically or conceptually and produce a gallery of these. I then need to identify an image from my gallery and identify an audience for it. 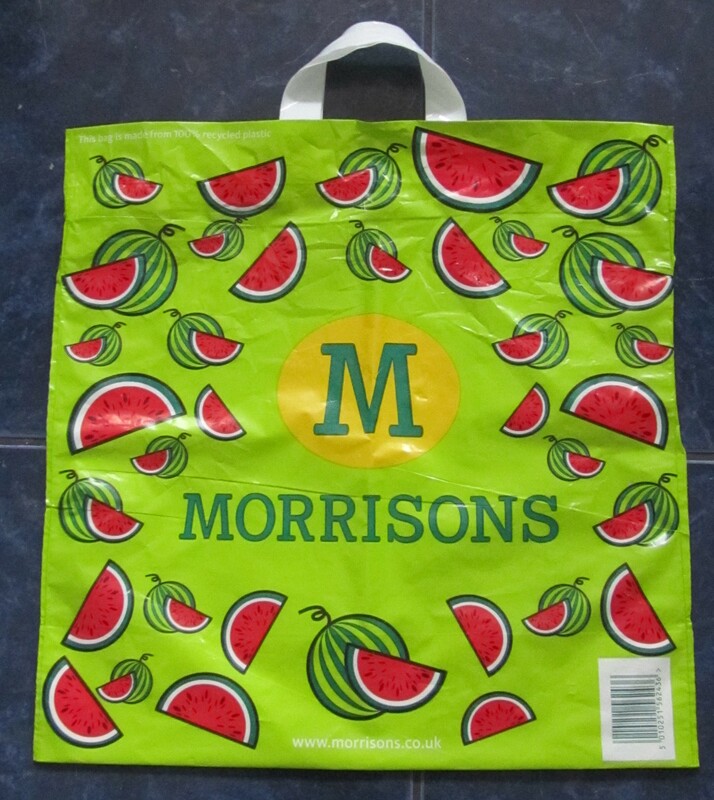 Recently most of the shops have had to charge 5p per bag if you didn’t have one of your own. 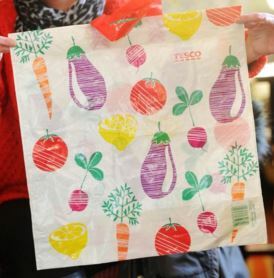 So there is a market for re-useable bags that are environmentally friendly. Then I need to look at producing the object as a commercially viable or appealing object. The fruits are bright colours and patterns. 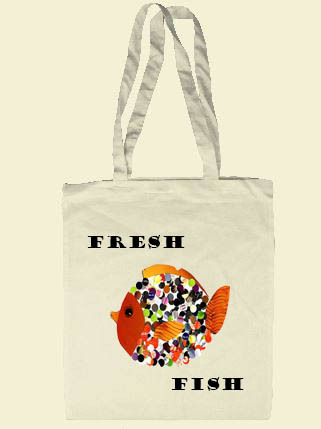 Simple designs and well matched colours are there to attract you that there are fresh grocery in their shops. 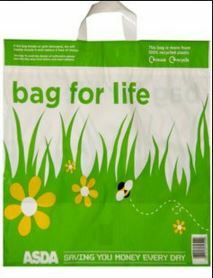 With the use of the words “bag for life” to remind us to save bags. The other day when I passed a fish monger in market. 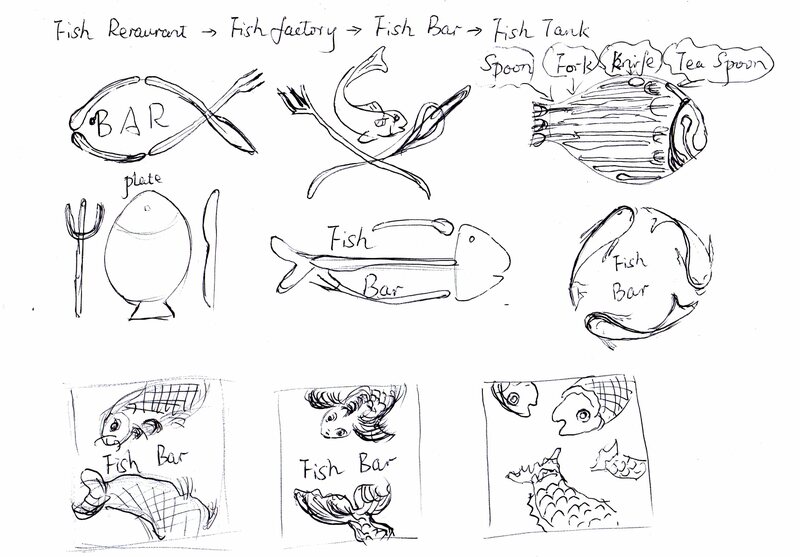 So I remembered that I had designed a menu card which is for a fish restaurant. 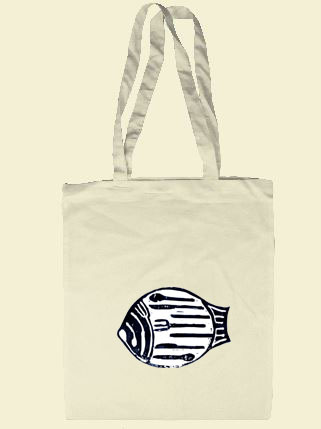 I am going to produce a design for a plastic bag and a tote bag. 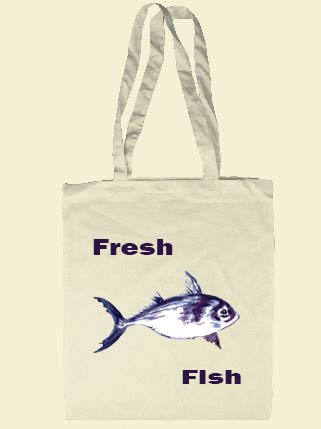 Then to practice my work on a tote bag. So I want them to have a simple pattern in the middle of each side and the basic words “Fresh fish” for fish market or “Fresh foods” for any of the supermarkets. 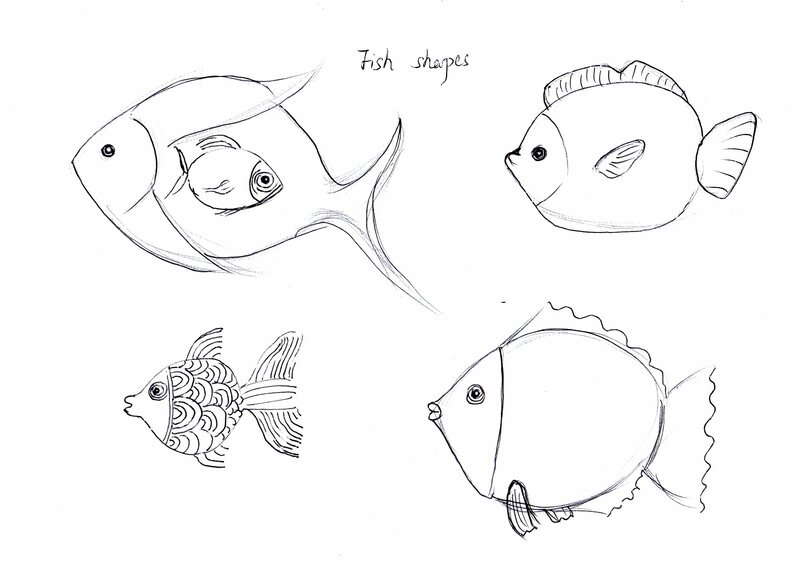 But the last one looks too much like a live fish even it looks more fresh with this image. 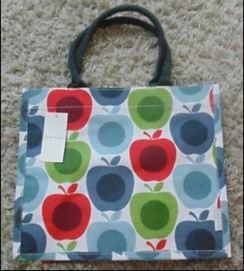 Another design is for preparing a bag to put in your handbag when you shopping. Overall I liked the black and white cat one because it looks appealing. And I’d like put it in my handbag to save the plastic ones when I go to shopping. 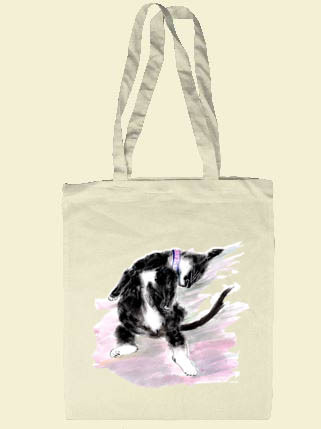 I like this design I based on a picture of my brother in laws cat. 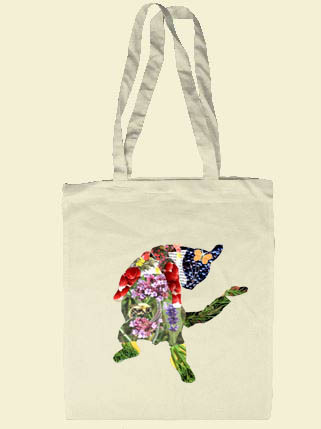 I have looked online they would be about £18 each to get it printed. This is just for a one-off bag. The prices would get cheaper if I was looking a producing more.